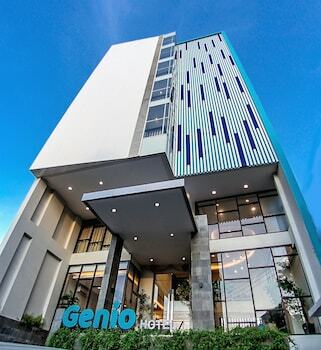 A stay at Genio Hotel Manado places you in the heart of Manado, a 7-minute drive from Ban Hin Kiong and 10 minutes from Mega Mall. Featured amenities include a business center, dry cleaning/laundry services, and a 24-hour front desk. A roundtrip airport shuttle is provided for a surcharge during limited hours, and free self parking is available onsite. With a stay at Palm Garden Hotel in Denpasar, you'll be near the beach, within a 15-minute drive of Sanur Beach and Mertasari Beach. Free self parking is available onsite. With a stay at Bingin Inn in Pecatu (Kuta Selatan), you'll be convenient to Bingin Beach and Padang Padang Beach. The front desk is staffed during limited hours. Free self parking is available onsite. With a stay at Airy Seminyak Kerobokan Kuwum Gang Rajawali Bali in Kerobokan (Kuta Utara), you'll be 7.2 mi (11.6 km) from Kuta Beach and 8.4 mi (13.6 km) from Tanah Lot. With a stay at Airy Kuta Bakung Sari 13 Bali in Kuta (Kartika Plaza), you'll be a 3-minute drive from Kuta Beach and 7 minutes from Tuban Beach. Free self parking is available onsite. With a stay at Airy Tanjung Uncang Brigjen Katamso 4 Batam in Batam (Sagulung), you'll be 13.2 mi (21.2 km) from Batam Centre and 13.3 mi (21.5 km) from Mega Mall. With a stay at RedDoorz Plus near ISOLA UPI in Bandung, you'll be within a 5-minute drive of Indonesia University of Education and Villa Isola. Free self parking is available onsite.